In 2009, I was a group leader for one of our organization’s expeditions. 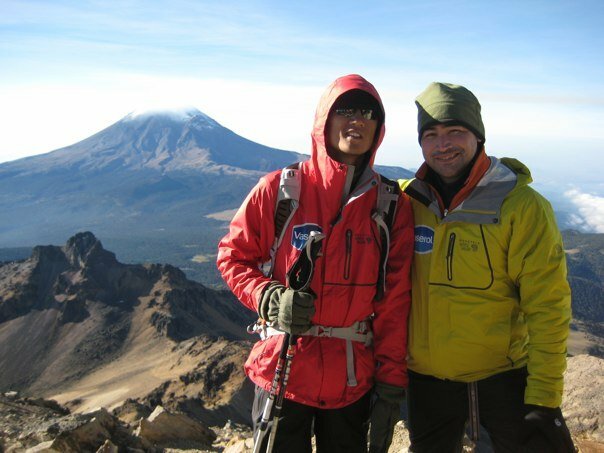 This involved taking blind and sighted young men and women to the 7th highest peak in North America, Iztaccihuatl. While my title on the trip may have been “leader,” I found myself learning more from our participants than I could possibly teach them. One of the participants who I grew close to was 23-year-old Army veteran, Steve Baskis. Since he was a small child, Steve Baskis had wanted to serve in the military like his father and grandfather. In January 2007, he enlisted in the Army with the goal of starting as an infantryman and eventually becoming a member of the Special Forces. By the end of 2007, Steve and his platoon were in Iraq. Eight months into his deployment, on May 13, 2008, everything changed for Steve. He was serving on a special security detail for a three-star general when the vehicle he was driving was ambushed. An explosive device rocketed through the passenger side door. Steve’s friend, Victor, who was riding shotgun in the seat that Steve was supposed to have been riding in that day, was killed instantly. Shrapnel, as well as fragments of his fallen comrade, were embedded in various parts of Steve’s body. He sustained injuries to his eyes, head, arms, legs, neck and back. A week after the accident, Steve awoke groggy and disoriented at the Walter Reed Medical Center, where a doctor told him he was blind and would likely never see again. In the subsequent six weeks, Steve underwent 12 separate surgeries. Steve spoke quietly but confidently and was not at all shy to tell his story. He was always organized, always in control, and offered few expressions from behind his sunglasses. He talked about how he feels bad that his parents are still saddened by his condition, but he’s happy with the life that he currently has and all that is in front of him. Including this expedition. We had spent the past week acclimatizing and we were now preparing for an early morning push to the summit the next morning. As we lay shivering in our sleeping bags at our high camp, 15,000 feet above sea level, I described to Steve what the sunset had looked like a few hours earlier. It had been a magnificent sight as a thick blanket of puffy white clouds had engulfed our camp. The sun dipped below the cloud floor and our camp immediately became dark and frigid. In our tent, Steve and I talked into the night about our doubts and what kept us driving forward. We were both exhausted after a week of climbing and Steve was concerned because he now had limited feeling in his left arm, a complication from his injuries, and he wondered how he would be able to plant his trekking pole. Steve reminded himself that this moment was a gift, even with the concern. He thought about his friend, Victor, whose wife now has no husband, and whose two children have no father. Despite his doubts about making it to the top, he felt he owed this to Victor to make the attempt. I promised that I would be there to take that picture. A few hours later, before the sunrise arrived, we headed out for our final push of 2,000 feet up the mountain. It was an arduous final push, but by 9am, Steve and I, along with several others from our group, stood celebrating at the top of Iztaccihuatl with the sun shining on our faces. Steve stood by himself smiling off to the side of the ledge. I gave him a hug, took his picture, and told him that he was now standing above the clouds.